Is it too easy? 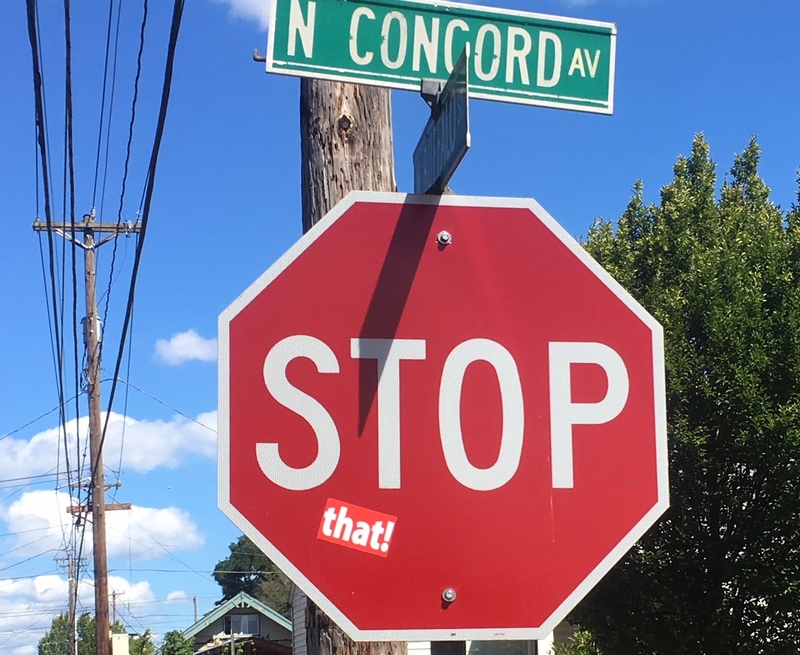 Think of your foremost pet peeve and write that word or phrase under the word stop on a stop sign. Or, better yet, get a sticker of the word or phrase so you can mass-produce your message. Even a politician’s sticker can be used against him. This protest is convenient, the opportunities are plentiful with stop signs being everywhere. These modifications do make the signs more interesting for those who pay attention to them. 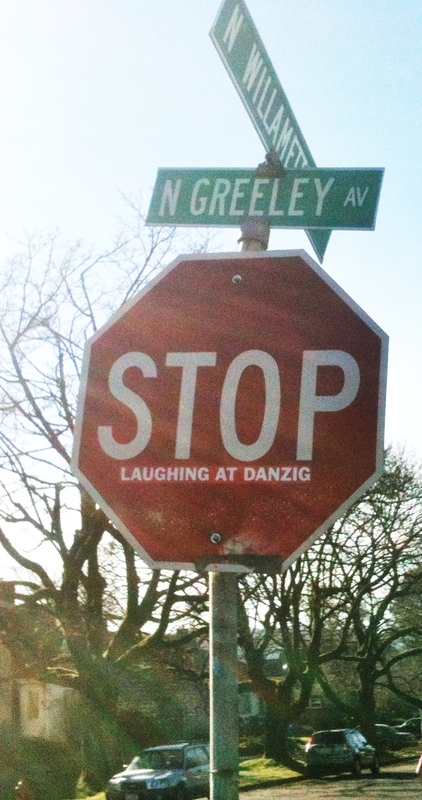 My stop sign fixation started a few years back when I noticed a stop sign modified to create a plea for people to stop laughing at Danzig. Sure it was an obscure message created for a select audience, but it opened my eyes to stop sign communiques. 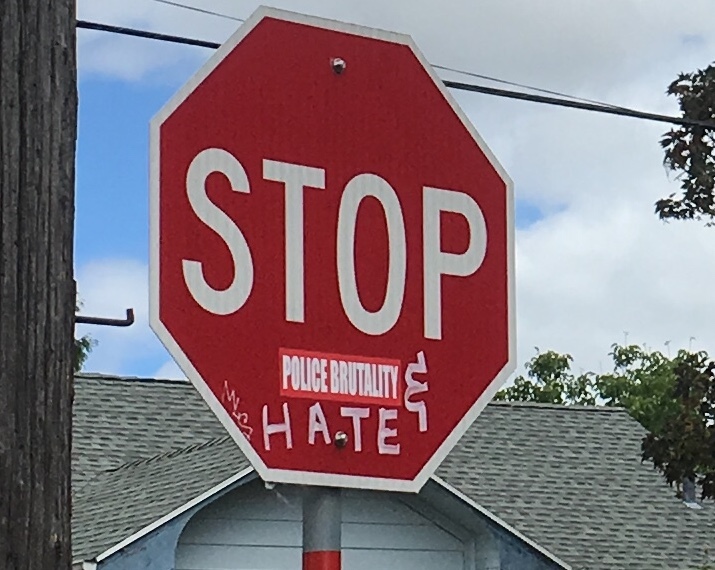 Stop signs now serve double duty. They command brake application and inspire protest possibilities. The sign decor makes an attempt to remind us of this sentiment. There’s one problem. No one planted any roses. The next task, if your pass this way on Capitol Highway in SW, is to find some roses to smell. Yes, for sure, there are many things to stop and many isms to conquer with the exception of my personal favorite, Bagism. Leave it alone! What struck me was how someone got their hands on a giant vat of white out which must have had an extra-large brush to screw off the container. 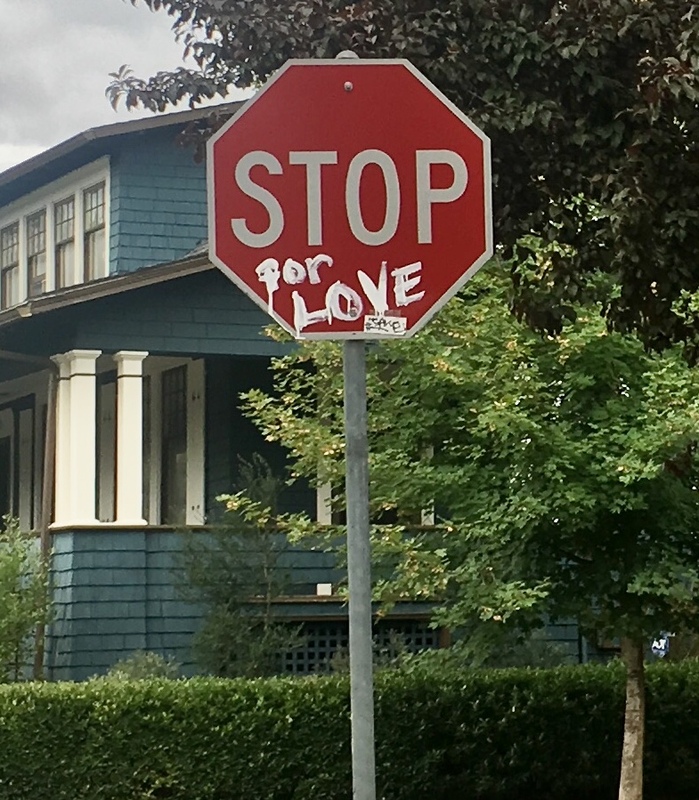 If the artist hadn’t been in such a hurry to mark up this stop sign in the Sabin neighborhood, the white paint could have spruced up the stop sign lettering as well. This sign spotted in the King neighborhood made me feel dumb. 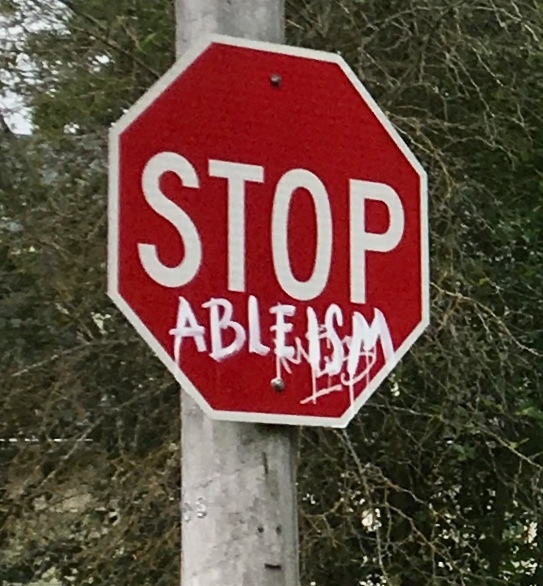 I had to ask what ableism is. I received a great answer but it’s been forgotten already. It’s important to note that if we all work together we should be able to stop it. Another sign in the King neighborhood seems to be inspired by a song title. The closest one I found was “Stop To Love” by Luther Vandross, so perhaps the message is more metaphorical than literal. 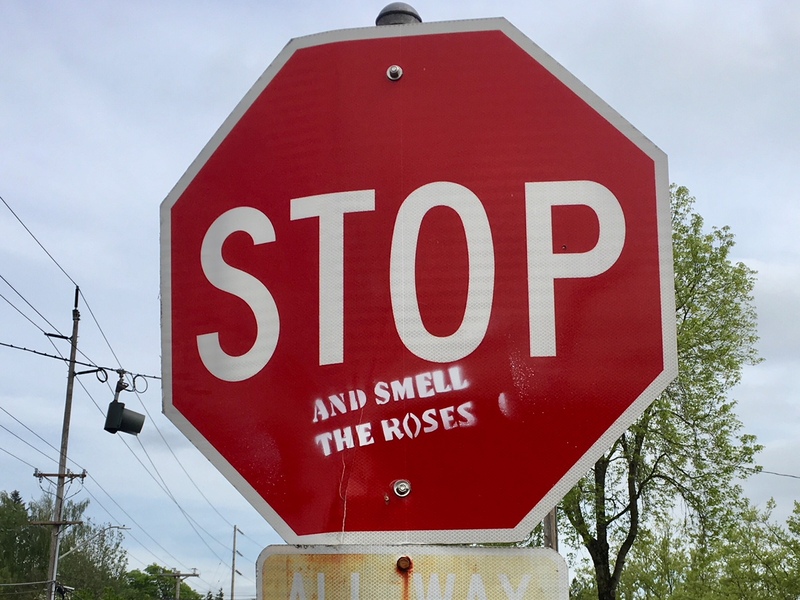 I was unable to find love around this stop sign anyway. My reason for stopping then had to do with the regulations I read about in the driver’s manual at the DMV which instructed me to obey all street signs. 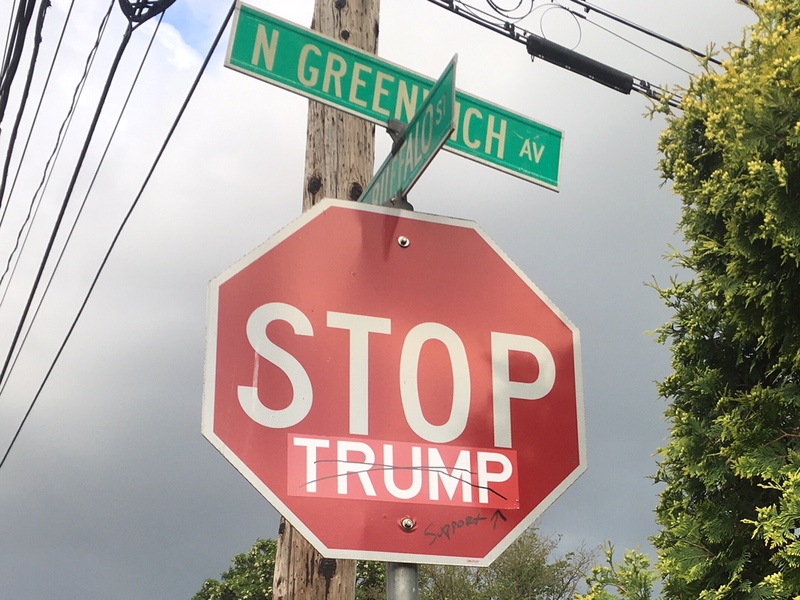 In the Kerns neighborhood this stop sign had been put through the ringer. 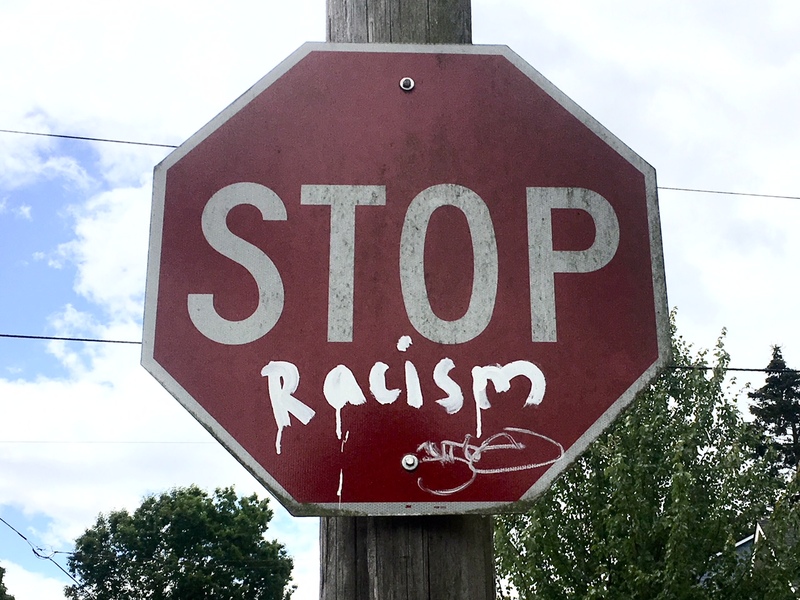 The offense of mistreatment include being scribbled on, stickered, tagged, autographed, initialed and scratched but it manages to keep delivering its message. 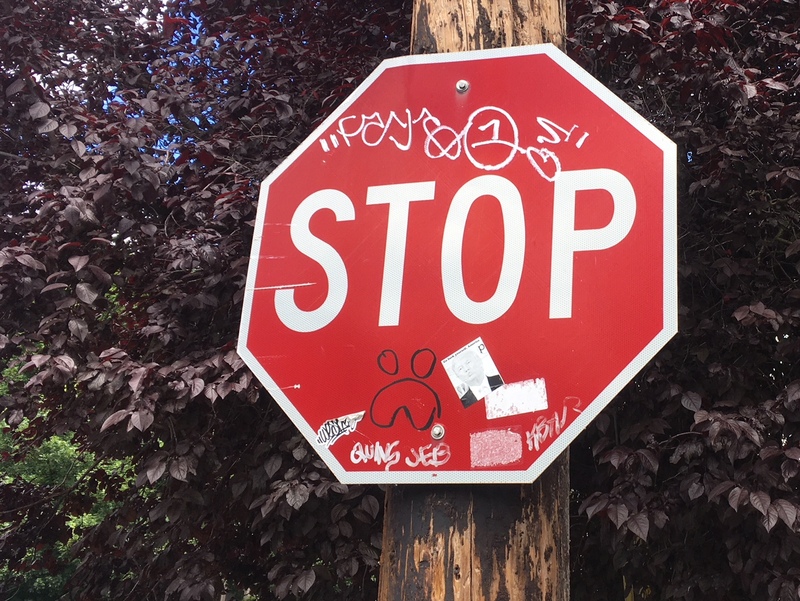 I understand its duty in controlling the flow of automobile traffic but I had to loosely interpret what concept this stop sign asking us to cease. After spying a hieroglyphic I surmised that we’re being asked to stop frowning. When the medium is the message it’s best muddle it. I sometimes get to the point where I feel like too much is being asked of me. This is the case with this Sabin neighborhood sign. It’s a tall order even to take on police brutality. I would have been willing to stop, read the sign and perhaps have taken the first steps towards taking action, but the additional request is too much. Really, I’m going to stop police brutality and in what time I have left over I’m going to squeeze in some hate stoppage. It’s overwhelming. Let’s prioritize. Once police brutality is stopped there may be a bit less hate in the world. 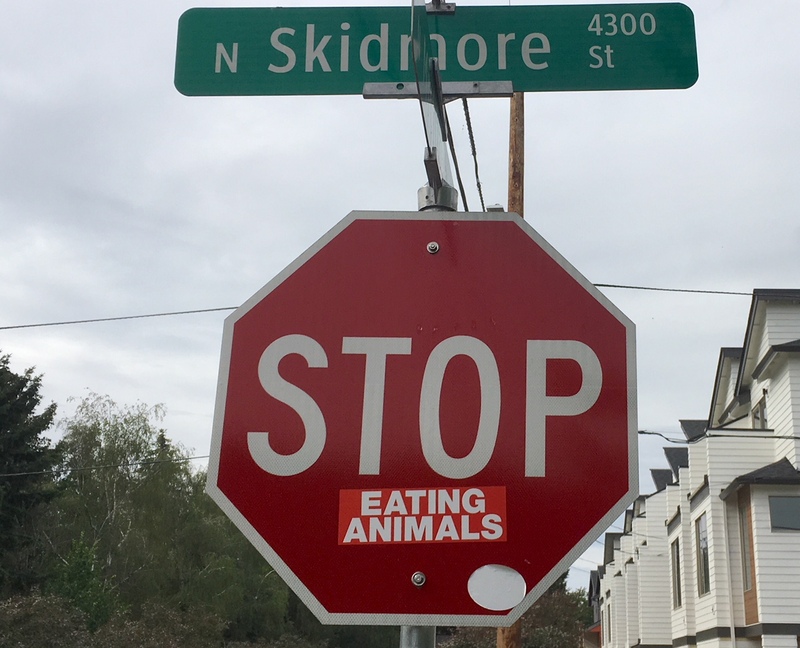 If I saw this sign in the Mississippi neighborhood on an empty stomach I might lose my appetite or head to the nearest vegetarian restaurant. I appreciate the request. Not eating animals would be good for the planet, people’s health and animals too, but I have to imagine that it would be necessary to try much harder to get people to stop eating animals. People are going to have to go down to the food cart pod and slap BBQ sandwiches out of people’s hands. It could get ugly. The sticker affixed to the sign does makes me realized how efficient this method is to bringing people’s attention to this cause. 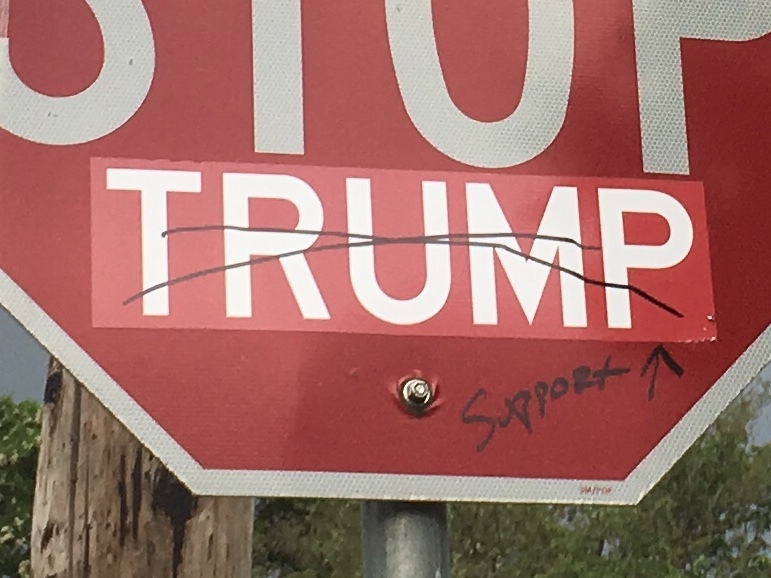 One message became two when one person’s attempt to stop Trump was crossed out. This isn’t exactly visible while driving but I encountered this sign on a bike. Someone must have become offended and tried to get their message across while obscuring the intent of the original. Now it’s becoming a jumbled mess that would have made more sense if the word stop had been crossed out. Another solution might have been to write support above Trump’s name. The arrow is the kicker, plain and simple, if you’re not sure who you’re being asked to support. It’s makes sense that I should end with something that, well, is kind of cute because after all we’ve all been asked to take on many different serious issues that need stopping. 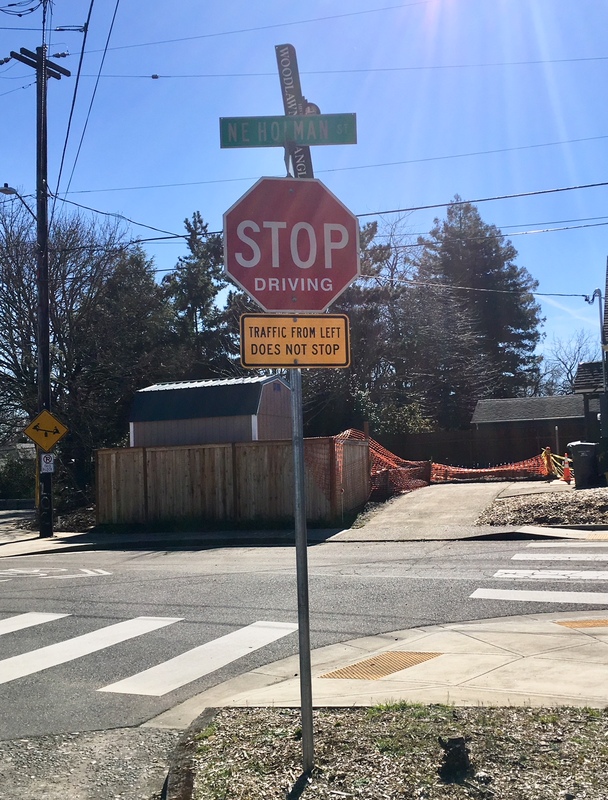 This sign in North Portland demonstrates that on rare occasions, stop signs, with a bit of help, can demonstrate a sense of humor.